Mobile homeowners were miles ahead of the tiny home curve, minimizing space and maximizing savings well before hipsters decided it was so hip. But you know what else is hip? Insurance. Well, maybe not yet. But someday, that’s for sure. And after you’ve read this, you’ll be the one ahead of the curve. Boom, now who’s the trend-setter? So grab a glass of OJ and let’s talk mobile home insurance. This 8-point guide will walk you through all the key factors to consider when evaluating quotes. And when you’re ready, our independent insurance agents can help you pull the trigger. Insurance carriers are the keepers of the policies. They design and sell insurance products and plans designed to help you when you need it most. And when it comes time to ‘insurance up’, you can either go through the carrier’s agent, or an independent insurance agent. In the case of independent insurance agents, there’s a lot more freedom. Since they aren’t tied to any one carrier, they can search and sift through tons of options. Not only that, they also follow along and keep track of info like carrier stability and reputation, so they can help you feel good about the choice you make. 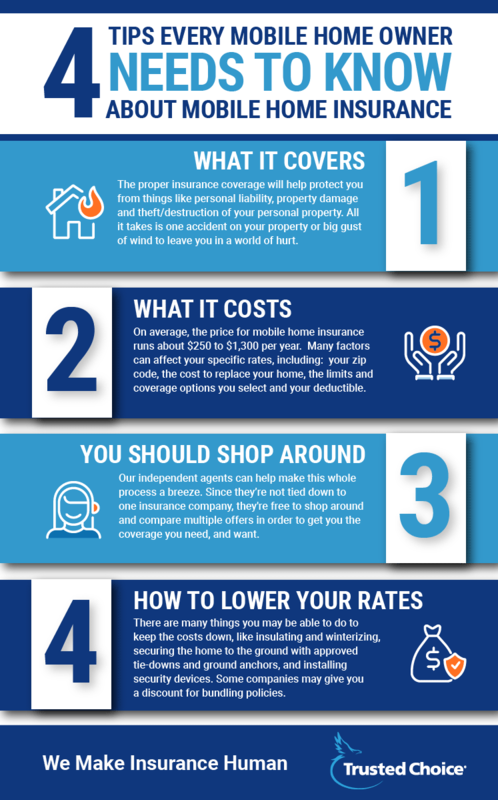 So let’s talk about the things an independent insurance agent wants you to keep in mind while searching for the policy that’s perfect for you. The whole insurance pricing game can be a bit complicated. There’s a whole lot of math that goes into setting prices. So when you receive your quotes, you may want to jump at the lowest-priced option. After all, who doesn’t want to get a sweet deal? But the lowest priced option will most likely skimp on some pretty big coverages. In many cases, it’s the mid-range number that will be your best bet. It’ll have more discounts applied to broader coverage and really help in the long run. What to look for: Don't be shy about asking which discounts have been applied and what others you might qualify for. And think about the what-ifs out there. If your mobile home was destroyed in a freak storm, it could wipe out your finances. So maybe consider springing for a policy that has higher premiums, because it usually comes with better coverage. With mobile home insurance, good service is all about accessibility. Many newer carriers, and even a fair number of the old, reliable ones, offer great cyber access and mobile options to keep you connected. What to look for: A 24/7 claims reporting line is a basic service that makes a big difference in an emergency. Disasters happen at all hours and your insurance company should be ready to spring into action. Extended customer service hours and online chat are also some pretty nice perks to consider. Here’s where paying higher premiums can actually net you some big rewards. Expensive companies often have more staff. That means they respond faster, so you can put flubs well behind you and get back to your mobile life again. What to look for: This one’s hard to judge from the outside. Ask agents or other mobile homeowners about their experiences with carriers, because a good reputation and fast service tend to go hand in hand. But be aware that speed often has a cost, and speedy companies are rarely the cheapest. Do you prefer the friendly service of a small company or the always-on efficiency of a national mega-insurer? Both have their benefits, and some mid-size companies combine a sweet blend of both. There’s no right or wrong answer to this one—it’s all personal. What to look for: If you’d prefer to know your insurance company as faces and names instead of ‘the next available representative,’ pick a smaller company. If you prefer high-tech features and long customer service hours, you might be better off with a big company. You pay premiums for a reason. If disaster strikes, your insurance company should be ready to make things right. But they can’t do that if they’re broke. Luckily, insurance companies are heavily regulated and rarely go under. There are clear warning signs for the bad eggs, too. What to look for: A.M. Best provides industry-standard ratings for financial stability. Spend some time on their site and learn a thing or two about the carriers in front of you. Many insurance carriers also prominently display their ratings on their websites. Anything A- and above is okay. Lower than that, buyer beware. With insurance, and stinky cheeses, older is typically better. They didn’t get to be so old by offering crappy insurance, that’s for sure. Older companies are usually more trustworthy than the new kids on the block. That said, upstart new companies are offering higher-tech solutions, intriguing discounts and exciting customer service. It all depends on what’s important to you. What to look for: Older companies will usually state their age clearly on their websites. (They know it’s a selling point.) Younger ones might hide it. If a snazzy new start-up—let’s say, one from 2010 or later—catches your eye, be sure to triple-check their stability before signing on. Insurance companies usually have niches. That niche could be that they only serve Topeka, Kansas, or that they’re really into insuring family farms. A niche company supports a community you love, and the community holds the insurance company accountable. Win-win. What to look for: If a community-based company is important to you, ask around. Search “mobile home insurance” + “your hometown” online. If you’re a veteran or service member, many insurance companies specifically cater just to you and may offer some baller discounts. Look, we all know your time is valuable. So why do all the hard work yourself? Our independent insurance agents stay on top of trends in the industry so you don’t have to. That means they’ll help you find the right coverage for you at the right price. They’re not just there at the beginning, either. If you get in a jam and need to make a claim, they’ll help you meet deadlines and ensure you’re getting all the benefits you’re entitled to. And getting benefits is totally hip, right?